No April fools joke for me on the 1st of April. I never was any good at them so they are best left alone. It is awlays better to know what things to leave behind! 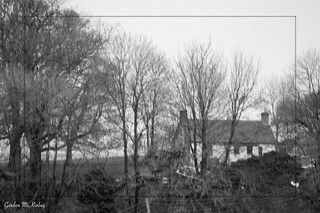 You can just about see this farm outbuilding from our house. With a nice long lens, however, it becomes possible to take this. It was a rather dull and damp day today so the photo was converted to black and white in order to make it a little more interesting.